One day when I was walking down Katoomba Street, I heard a voice call my name, rather excitedly. “Sister Colleen!” I looked around and there was a young man standing in front of me. I did indeed remember him; let’s call him Joe. It must be 10 years since he left primary school The young lad I remembered found school tough going. He struggled with the routine, and he struggled to fit in. He and I had many informal chats but I never felt as though I got to the bottom of his restlessness. Joe is a young man now, and he told me about his interesting job, his new partner, and their new home. As we came to the end of our conversation, Joe said, “Oh Sister Colleen, please give me a hug!” What joy! St Canice’s is a small school. The principals, teachers and staff over the years have built up a homely, accepting environment, where the individual child and her/his concerns really matter. This is my 22nd year as Parent Liaison, so no wonder I know so many of the parents, grandparents, uncles and aunties of the present pupils. In 1985-86 I was the Principal at St Canice’s School. My three days a week are busy and varied, but never too busy that I can’t drop everything and be with whoever is in need. Sometimes I am a listening ear and sometimes I am a helping hand. Being a Sister of Charity for 52 years means that my motto, “Love Strengthens” is my daily inspiration. The Sisters, my family and friends are my support. 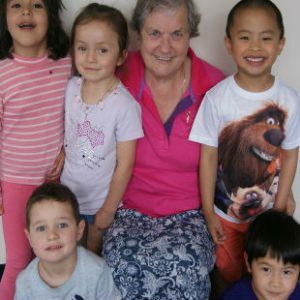 Editor’s note: Sr Colleen concluded her ministry at St Canice’s in November 2017, after 24 years working with children, parents, and staff. Here is the presentation given by the Congregational Leader Sr Clare Nolan at her farewell from the school.